After a wonderfall couple of weeks exploring the wooded valleys of Germanys Black Forest we emerged at the Swiss border town of Schaffhausen, where we stayed at a peacefull river-side camp-site. 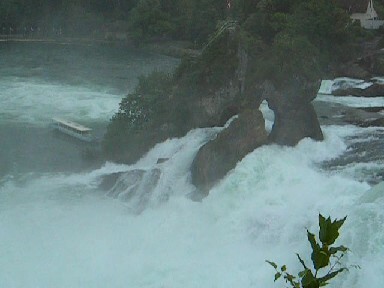 Our goal here was to witness the largest water-falls in Europe ; The Rheinfalls at Neuhausen. We decided to take the tram from here to the Falls, on leaving the tram, the helpfull driver pointed to brass footprints inlaid in the pavement and said to follow them for the Falls. There are several ways of viewing the magnificent spectacle of foaming water. During a pleasant stroll you can take in the visitors centre and the staging where the tour boats will either ferry you across the Rhein or to the strategically positioned island. With a short pathway upto the viewing platform the raging waters are surrounding you. Or you can cross the 150 metre wide falls just upstream of the 23 metre drop by a covered footbridge. 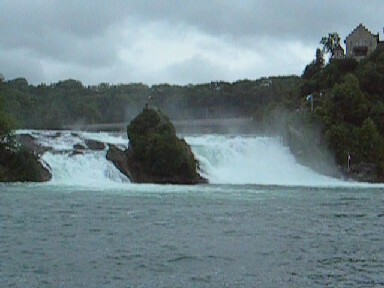 The falls are reputed to be between 14,000 and 17,000 years old. Another spectacular viewing area can be reached by entering the gift-shop above the southern side. On payment of one euro you exit by a side door and zig-zag down and sometimes through the rock to a cave like area where you are within touching distance of the awesome power of the crashing river. After this wonderfull experience we took the wooded river-side 7 km. pathway back to our camp-site. A very good entry to Switzerland……………..